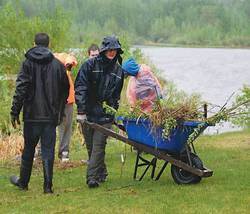 On a cool and wet 25 May 2013 cadets and staff met at By-the-Lake-Park in Wetaskiwn to do some community service. The cadets were briefed on their jobs by city of Wetaskiwin worker Mr. Byron Olson on what their jobs would be, stream and shrub bed. The cadets were divided into teams and they got to work. One group started digging out the shrubs that did not make it over winter and hauling them away while the other group got busy cutting out shrubs along the stream bed and removing the dead cat tails. When the cadets first arrived it was just a light sprinkle but that slowly changed to a downright pouring. This did not dampen their spirits and they cheerfully kept working till lunch time. After lunch the cadets finished all of their assigned duties and were free to go home to a hot shower or bath and dry clothes. #42 Wetaskiwin is proud and delighted to do this work. We believe that all citizens should give back to their community. We will continue to do this work for as long as we are needed. Thank you to the City of Wetaskiwin for allowing us to help in this way.